Now that wedding planning is going full speed and every day decisions are being made regarding the details of our wedding travels and the actual wedding day, I have been feeling a lot of emotions. This week I have been in a reflective mood. I look back at how far we have come in less than year. We got engaged on May 29, 2010 and getting married a year later on May 30, 2011. Yesterday, when we spent a special afternoon back to our engagement spot, it felt really special. The feeling hit me that things are coming to a full circle. I look back and see where we’ve been and now, look where we are. 81 days before our wedding. Our decision to have a destination wedding was easy for us. We knew what we wanted, we knew what would make us happy. Not everyone agreed with the decision. But we carried on. We always do. I am so happy that all our immediate family, close relatives and our closest friends will be traveling with us and witness our special day. Today, I posted a small Thank You note to our guests…. I know I will say a thousand Thank Yous between now and even after the wedding. I just feel so grateful for everything. You know what else I’m grateful for? These muffins that I enjoyed while nursing my cold. Recipe adapted from here. I replaced buttermilk with a non-dairy milk and apple cider vinegar. This substitution worked well for these vegan cupcakes, so why not try it here too. 3. 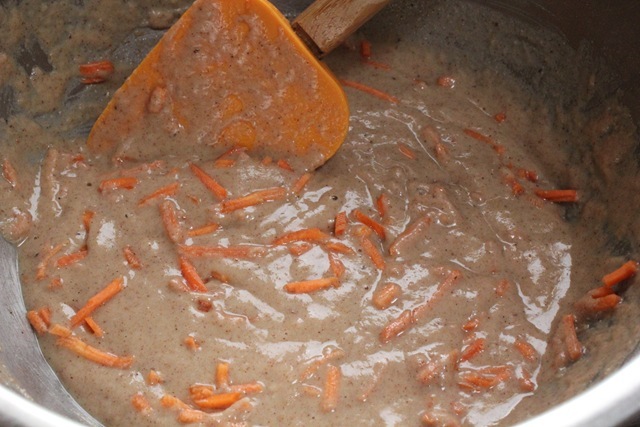 In a separate bowl, beat together the eggs, sugar, oil, non-dairy milk, vinegar and vanilla. Using a whisk or a spatula, stir in the dry ingredients and mix until well combined. Do not beat; a few lumps are fine, but make sure there is no flour at the bottom of the bowl. 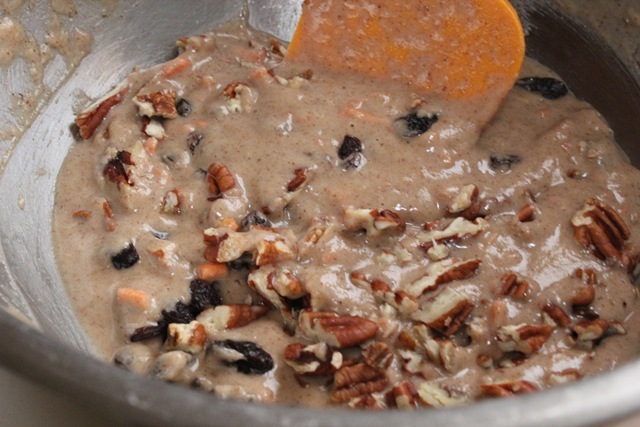 Fold in the raisins or pecans and the carrots. These are slightly sweet, which is how I like breakfast muffins to be. The raisins add sweetness on top of the sugar. The scent of the spices while these muffins are in the oven will call everyone to come into the kitchen. I made a few muffins baked with sprinkled brown sugar on top. These were served to friends with sweet tooth. It made a caramelized and crunch topping. Puerto Vallerta! Wow! What a gorgeous destination wedding spot! 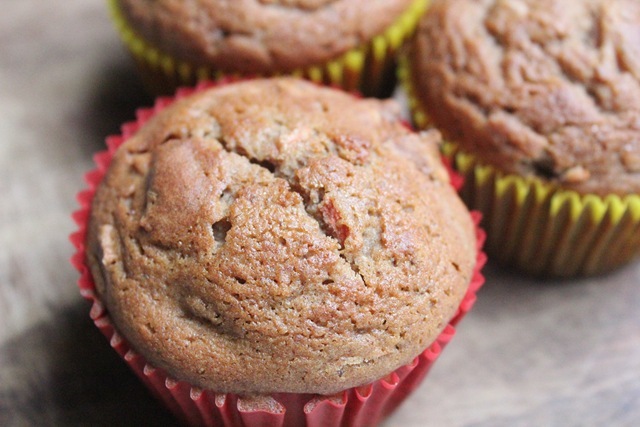 And thanks for the recipe, I would have never thought to use apple cider vinegar for carrot cake muffins though I have been drinking it regularly! What do you drink the apple cider vinegar with? Do you drink it hot or cold? Since buttermilk is sour, the almond milk + apple cider vinegar was my substitution for that. I’ve done it twice in recipes and it works. I think it’s so fun to look back and reflect on how time grows relationships and works things out! Emily, that is so true. I’ve always been the type to look forward to the future but also reflects on the past at the same time. During wedding planning, you get to reflect a lot on things in your life and relationships because every detail has a story behind it that makes it special. Thanks Erica, so many exciting things in the future for both of us. I can’t wait to see pictures of your baby girl, she’s going to be so adorable. 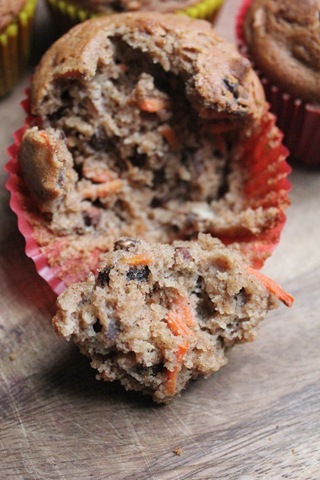 I have a recipe for carrot cake muffin made with almond flour that I want to try soon. I think this recipe will work too with GF flour. OMG those muffins look so yummy and airy I love that about muffins. Ok now that I got that off my chest. Back to whats more important. Lea I can here it in your words how happy you are and how emotional it’s going to be for you. Love is such a beautiful thing and sharing your special moment with us here is special too. It’s such a great feeling to feel someone else’s love! Hope it’s what you expected and more. Thank you so much for your lovely comment. It really sums up how I’m feeling right now. It’s hard for me to put it in words, but I do my best to describe it because I know years from now, I will want to remember how it felt every step of the way during the wedding planning process. I’m glad you enjoyed the parts here and there of the wedding planning. It’s taking up most of my time right now so naturally, it’s all I can think of and write about too. Love your comment. Diet Bomb and vegetable corruption…I love the description. Thanks for making me laugh. ohhhh carrot cake makes my life. i am bookmarking this. i love the thank you notes! 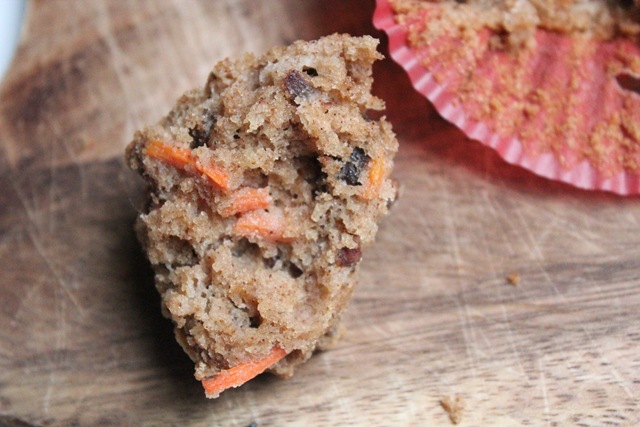 Mmm…I love carrot cake, even in a healthier, muffin form. It’s very exciting to hear about your upcoming destination wedding! My brother also had a destination wedding and it was one of the best trips I’ve ever been on. I’m sure your guests will feel the same! 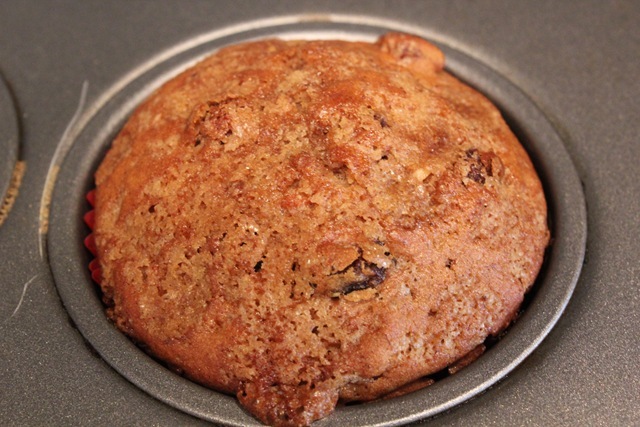 This muffin is definitely healthier and it taste healthy too. What’s good about muffin form is that it’s built in portion control too. Thank you. 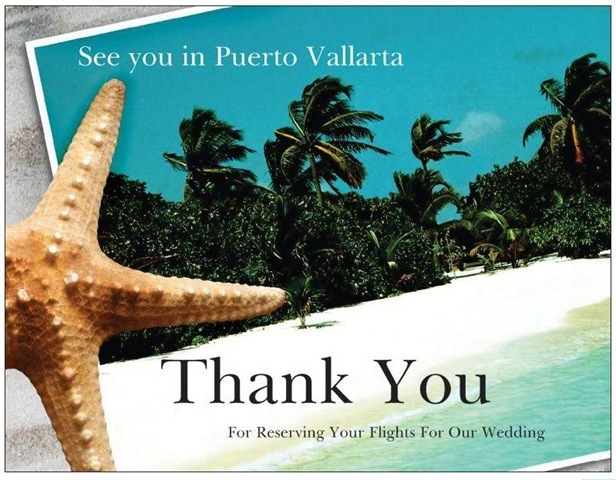 It’s good to hear that you loved the trip you made for your brother’s destination wedding. I really want to make our weddings guests feel special and have a great time too. What I loved most about my bro’s destination wedding was that we had a lot of sightseeing/touristy things to do along with the wedding stuff. So it was like a tour group and wedding in one. Plus it was in Rome so there’s a lot to do and see as it is! Very cool! Love that you’re doing destination – so exciting! I would definitely prefer the ones with brown sugar on top! The muffins look so yummy!